The Voyage (Alfred A.Knopf, 416pp) is a high seas adventure yarn, a Victorian melodrama, a generational saga, and a mystery all rolled into one. Salty readers rest assured, the high seas adventure is the longest and best part. The novel opens on a cool and foggy summer day in Maine. The year is 1901. A self-made granite tycoon is moodily supervising his three young sons as they haul gear down the lawn from the summer cottage to the dock. The boys are provisioning the family yacht, a forty-six foot schooner, the Double Eagle. They have been ordered by their father to leave home and not to return until September. No explanation has been offered. The boys are mystified. The voyage is off to dark and slow start. Don't be discouraged. The author's initial tendency to over-write and fondness for long convoluted sentences evaporates as soon as the action starts (page 78). The writing style becomes crisp and graceful and enjoyably plain for the duration of this gripping novel. 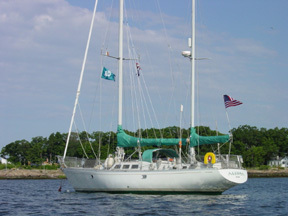 The three bewildered teenagers, a cat, and Will, a college boy, sail Double Eagle from Vinalhaven to Key West. They stop in New York and get beaten up in a bar. Then, off Hatteras they get beaten up by a hurricane. When they duck into a gunkhole on the Carolina coast for repairs at Sneads Landing, Will is nearly shanghaied into marrying. The boys sneak away before dawn. In Beaufort, they meet a relative whose existence was barely acknowledged in their Boston home. She befriends them generously. In Key West they meet an endearing West Indian character named Artemis Lowe, "a strangely built man, no taller than five feet eight, and two-thirds of that was torso, the shirtless torso under the overall's bib like a stout barrel casking the lungs of the diver he had once been." Artemis takes the Double Eagle and the boys to the Dry Tortugas where she is dismasted in another hurricane and blown all the way to Cuba. Getting home to Boston is another story! The high seas adventure part of The Voyage could stand alone as a complete novel with very little tinkering. Caputo renders the moods of the sea with a measure of mistrust which suggests he's been there. The relationships of the brothers are well-drawn, the middle boy being the mediator between the younger and the older. And the characters of the boys are deftly drawn, developing over the course of the voyage. Early on, the reader cares about them. However, the voyage is essentially incidental to the larger plot. Weaving the family saga, the Victorian melodrama and the mystery into the ocean voyage is accomplished by means of flash forwards by great-grandaughter Sybil who is reading the ship's log. The device is clumsy and distracting. These flaws in the novel's structure do not constitute a negative recommendation. It is a truly salty yarn by someone who knows his way around a boat. A good read for the summer cruise!